The multidimensional character and inherent conflict with categorisation of interdisciplinarity makes its mapping and evaluation a challenging task. We propose a conceptual framework that aims to capture interdisciplinarity in the wider sense of knowledge integration, by exploring the concepts of diversity and coherence. Disciplinary diversity indicators are developed to describe the heterogeneity of a bibliometric set viewed from predefined categories, i.e. using a top-down approach that locates the set on the global map of science. Network coherence indicators are constructed to measure the intensity of similarity relations within a bibliometric set, i.e. using a bottom-up approach, which reveals the structural consistency of the publications network. We carry out case studies on individual articles in bionanoscience to illustrate how these two perspectives identify different aspects of interdisciplinarity: disciplinary diversity indicates the large-scale breadth of the knowledge base of a publication; network coherence reflects the novelty of its knowledge integration. We suggest that the combination of these two approaches may be useful for comparative studies of emergent scientific and technological fields, where new and controversial categorisations are accompanied by equally contested claims of novelty and interdisciplinarity. This research was supported by an EU postdoctoral Marie-Curie Fellowship to IR, and the Daiwa Anglo-Japanese Foundation. We benefited from discussions with J. Gläser, L. Leydesdorff, F. Morillo, A.L. Porter, and SPRU colleagues S. Katz, R. Kempener, W.E. Steinmueller and A. Stirling. Batagelj, V., & Mrvar, A. (2008). Pajek. Program for large network analysis. http://vlado.fmf.uni-lj.si/pub/networks/pajek/ Accessed 15-01-2008. Kiss, I. Z., Broom, M., Craze, P., & Rafols, I. (submitted). Can epidemic model describe the diffusion of topics across disciplines? Available at http://www.sussex.ac.uk/spru/irafols. Persson, O. (2008) Bibexcel. A tool-box programme for bibliometric analysis. http://www.umu.se/inforsk/Bibexcel/ Accessed 01-02-2008. Rafols, I., & Leydesdorff, L. (2009). 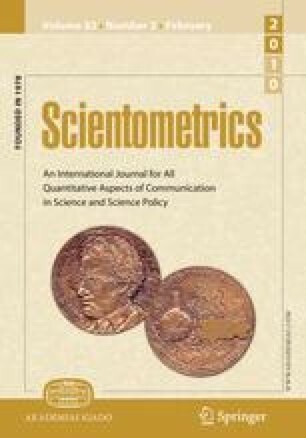 Content-based and algorithmic classifications of journals: Perspectives on the dynamics of scientific communication and indexer effects. Journal of the American Society for Information Science and Technology. doi: 10.1002/asi.21086. Stirling, A. (1998). On the economics and analysis of diversity. SPRU Electronic Working Paper. http://www.sussex.ac.uk/Units/spru/publications/imprint/sewps/sewp28/sewp28.pdf Accessed 01-04-2006.